Hello, Slow Cooker Fans! 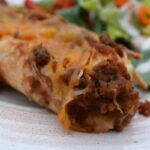 I’m happy to be guest posting for Sarah today with our super easy Beef Topped Bean Enchilada recipe. It’s so easy, kids can make it. We have video proof. I’m Angela Coffman from GroceryShrink.com, where we blog all about money issues, family life, and home remodeling. We are a family with 6 kiddoes ranging in age from 15-3. In between violin and piano lessons, ballet class, soccer & basketball practice, youth group meetings and school play rehearsals, we rely on the healthiest and most affordable convenience foods to survive. Brown the ground beef with a little garlic (and onion if you like.) Drain off any fat. Blend the salsa to remove chunks if you have picky eaters. Place a little salsa in the bottom of your slow cooker, then stir the rest into your ground beef. Then chop up your olives into dices. We used a Handy Chopper. Place a small amount of refried beans, olives, and cheese on the edge of a tortilla. Roll up and place seam side down in the bottom of your slow cooker. Repeat for the remaining tortillas. Top with your beef and salsa mixture. Then cook on high for 3-4 hours or on low all day. Top with cheese for the last few minutes and let it melt in. Serve with corn, rice, and a side salad. I bought everything except the cheese at Aldi. We buy our cheese at Costco, because it's cheaper in the 10 lb bags. Slow Cooker Asian Meatballs - So Easy!